The Disciples (Strait Truth Series, Book 2) by Celeste Perrino-Walker, 226 pages. As I have commented in one of my reviews before, the two criteria I use to determine if a book is great and not just good are (1) did it surprise me? and (2) did it stick in my mind long after I put it down? Stabbed and left for dead, Lilliana Vargas receives aid from the most unlikely source and is thrust unwillingly into the secret, underground domain of her rescuers, a group of Christians who call themselves the Disciples. She manages to shake her “keepers” long enough to get herself into an even worse situation. Saved once again by Someone whose existence she’d rather not even acknowledge, Lily is forced to face her life as it is and as it could be. With the world crashing down around their ears, will she stay, or will she go back to the streets and try to navigate the coming crisis in which escape is not an option? The second book in a series, The Disciples is very well written. I loved The Shaking, the first book in the series, mainly because it tells the story of a reformed lesbian who struggles with acceptance by fellow Christians. It’s a story that you hardly, if ever, hear. It’s a unique story with strong characters, plot twists and turns that will keep you guessing, and a satisfying ending. It also serves to set up a world that is rapidly coming to a close, and the challenges that lie before committed Christians at that time. 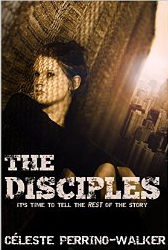 The sequel, Disciples is the story of a drug addict who is rescued by Christians during this dangerous time, and despite much resistance, ends up joining them. It also has strong characters and a fascinating storyline. I especially like the relationship between Lily and an eccentric, loveable former professor who is now an underground Christian, but being a professor, that’s probably to be expected. The Disciples, in my mind, could be seen as two books. The first part tells of Lily’s rescue and how she develops a relationship with the group of underground Christians. The second develops into a series of the events that transpire as earth’s history wraps up and Jesus returns once again. The only hiccup I had with the second part of the book was that there were no major surprises for me. On the other hand, if your book is going to end with the Second Coming, there probably aren’t a lot of surprises that you can offer. And I’m probably being unfair here. The book kept my attention–I read it in two sittings–and was well told. It is entertaining while offering a strong spiritual message. It’s one of those books that sticks with you after you put it down, and makes you take another look at your own spiritual walk. If you like Christian fiction that is more than just a story with Christian tagged on after the fact, then this is the book for you.